Ultra-wide LCD displays mount in front of each member to show names to the audience. 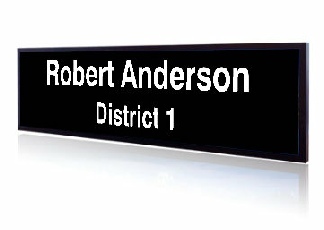 The VoteLynx Electronic Name Display function replaces traditional pre-fabricated plastic name plates that have to be changed for each meeting type. Member names and represented area are automatically updated as a meeting is selected in the VoteLynx meeting management software application. The VoteLynx system supports the use of typical LCD displays or ultra-wide displays mounted on the front of the dais facing the audience. Typical ultra-wide displays include 19” 1920x388 pixel and 16” 1366x238 pixel resolutions. Displays connect directly to the second video output of the VoteLynx Graphic User Stations. Connectivity for VoteLynx systems using MiniTouch vote panel is coming soon.